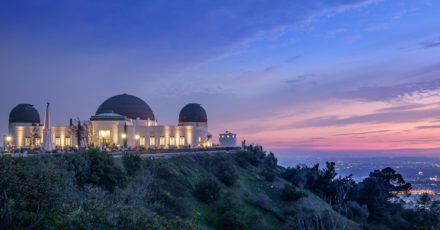 One of Los Angeles’s architectural gems is back! 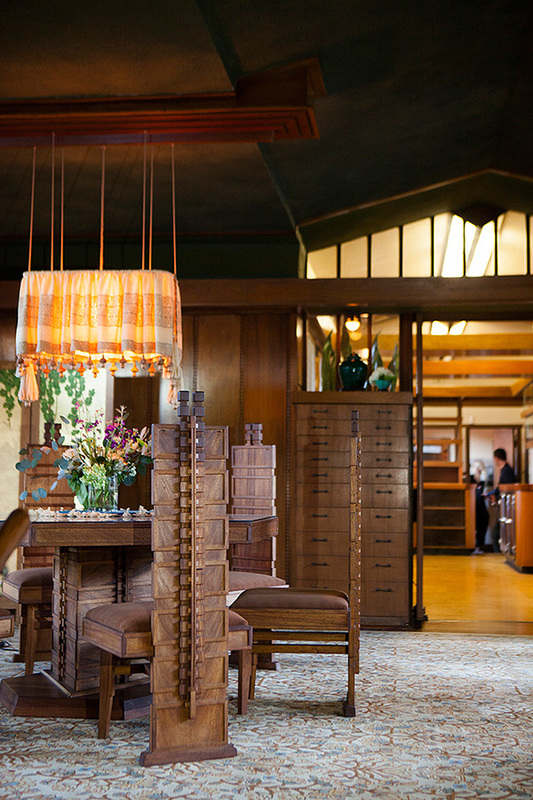 After a six-year extensive restoration, you can once again tour Frank Lloyd Wright’s first commission in this city. 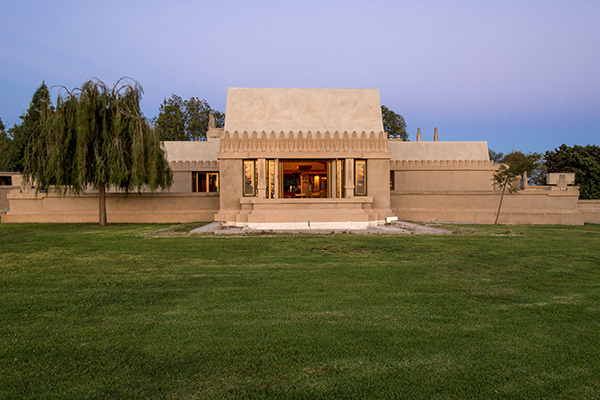 Hollyhock House is a gorgeous Mayan Revival style house with 17 rooms and 7 bathrooms. Oil heiress, theater producer, single mother, and social activist Aline Barnsdall commissioned the house, and it was originally intended to be part of an avant-garde arts and theater complex known as Olive Hill, now known as Barnsdall Art Park. Barnsdall tapped Wright for the job when she bought Olive Hill in 1919. Wright was hired to design multiple buildings, but he only finished the plans for Hollyhock House before being fired. He wasn’t on the job long enough to see the house completed in 1921. This project marked a transitional moment for Wright, as it heralded the end of his prairie style home period. It also marked a turning point in the history of modern architecture in Los Angeles; the house’s construction brought three seminal architects—Wright, Rudolph Schindler, and Richard Neutra—to the city. All three went on to create iconic buildings throughout Los Angeles, defining California modernism in the process. It’s one of the many L.A. treasures listed on HistoricPlacesLA.org, a historic preservation resource from the City of L.A. and the Getty Conservation Institute. Here are 12 facts about this newly reopened historic landmark. Unlike Wright’s other Los Angeles commissions, “Hollyhock” is not someone’s last name. 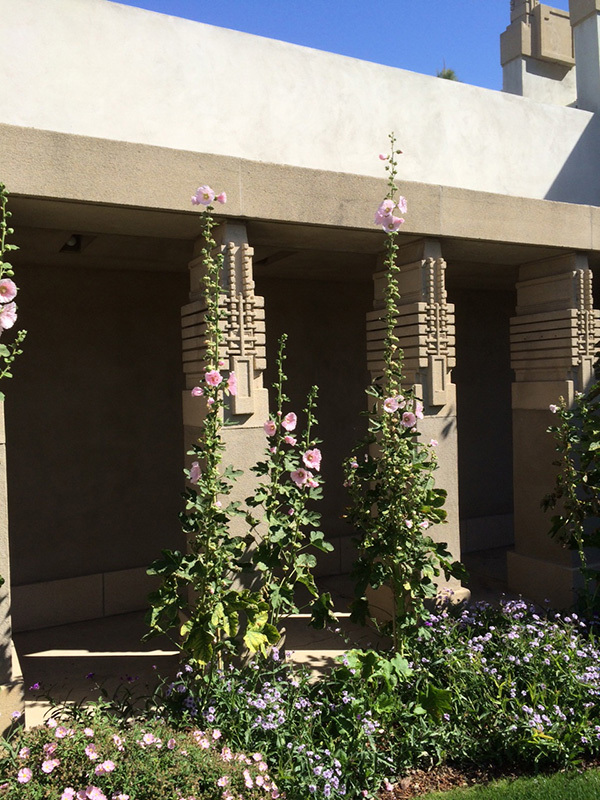 Before it was even designed, Barnsdall decided to name the house after her favorite flower—hollyhock. Wright used the name as inspiration, implementing an abstract hollyhock motif throughout the house’s façade and interiors. Actual hollyhock flowers are located in the central courtyard and the exterior spaces. 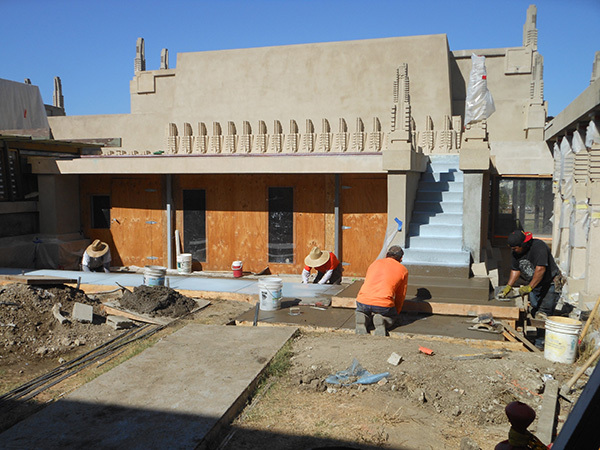 Hollyhock House is almost 100 years old, and with age comes much need conservation work. Due to financial limitations, Wright used hollow clay tile and plaster instead of poured concrete to build the house. These materials made the structure susceptible to water and seismic damage. Over the years, the house has confronted intense leakage problems, sagging concrete beams, distorted paint color, cracks in the pool, soil settling, and the impact of some pesky trees. In 2005, a restoration team fixed damage caused by the 1994 Northridge earthquake, but many other problems remained. Their work lead to a ton of discoveries about the original 1921 house, as well as previous conservation efforts in the 1940s, 1950s, 1970s, and early 2000s. Luckily for the preservation of Wright’s work, Project Restore assembled a team of experts to spearhead the conservation and restoration of Hollyhock House. Initial funding was provided by the California Cultural and Historical Endowment and grants from Save Americas Treasures. Additional support was provided by the City of Los Angeles and the National Parks Service. 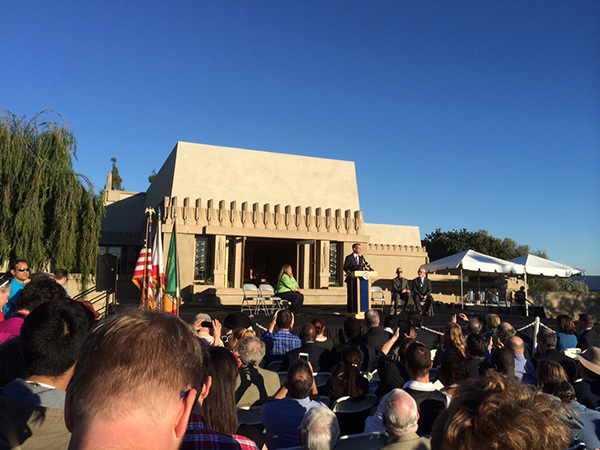 Project Restore was awarded the 2014 California Restoration Award for their work on Hollyhock House. Full slideshows of the whole conservation process can be seen on Project Restore’s website. During the construction of Hollyhock House, Wright was also working on the Japanese Imperial Hotel. The Japanese project became a source of inspiration for the Los Angeles home. 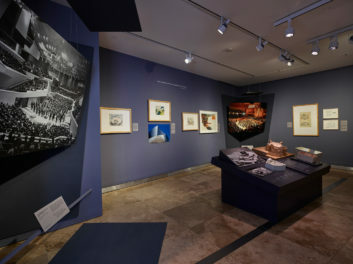 The inclusion of Kwon Yen Buddhist sculpture, screen paintings, and an open floor plan, which allows visitors to flow from room to room, are all nods to Japanese art and architectural traditions. Wright also incorporated the idea of “compression and release” in Hollyhock House. When you walk through the main entrance, the roof and walls are low and narrow, leading to an overwhelming sense of release once you move into the living room with its expansive high ceilings and lowered floors. Another Japanese-inspired idea is the metaphorical inclusion of the four elements—earth, water, fire and air—in the house. The concrete bas-relief of the fireplace represents earth, the fireplace itself and the torchiere lamps allude to fire, the skylight references air, and the entire home is surround by a moat representing water. 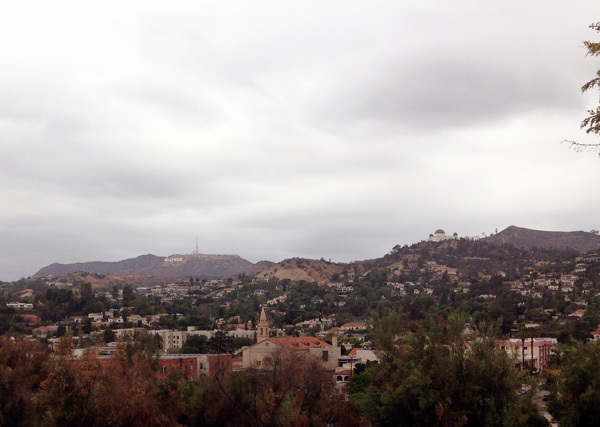 The concrete bas-relief, considered one of Wright’s greatest works of art, is said by some to be an abstract representation of Barnsdall as an “Indian Princess” on a hill overlooking the city. After a century of use, it is understandable that some of the furniture had to be replaced. The curator of Hollyhock House, Jeffrey Herr, used old photos to find or reconstruct exact replicas of objects and furniture in the house. But many of the pieces are original, including the dining room chairs from 1921. The chairs feature a hollyhock motif along with what looks to be a human spine—perhaps an expression of Wright’s macabre sense of humor. 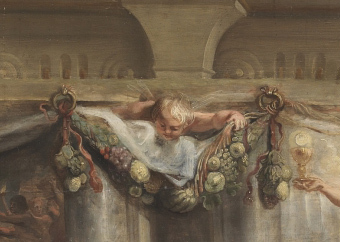 When touring the house, visitors can guess which objects are original and which are exact replicas. **Spoiler Alert** Speaking of replicas, one item known to be a copy is the grand couch located in the living room. At some point during the house’s life, the original couch mysteriously disappeared. Due to time restraints, budget decisions, the architect’s preoccupation with projects in Japan, and tensions with Barnsdall, Wright did not finish construction of the house. Rudolf Schindler came to Los Angeles to work as project manager for Hollyhock House under Wright, and he was hired to finish the remainder of the home after Wright was fired by Barnsdall. 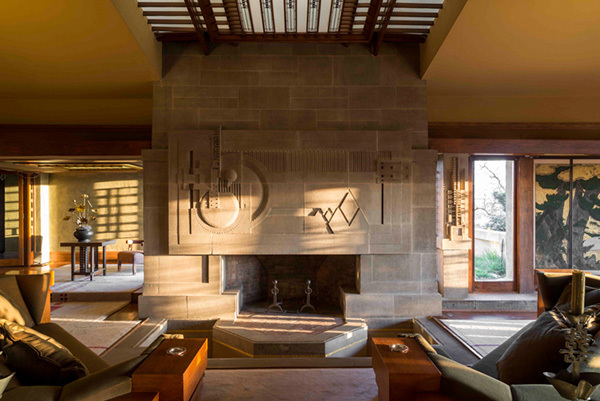 Schindler contributed several architectural features to Hollyhock House, including the camouflaged locks and Barnsdall’s bedroom. After developing his own successful body of work in the city, Schindler urged Richard Neutra to follow. Through the Hollyhock commission, three important architects wound up in Los Angeles. Wright’s eldest son, Lloyd Wright, was an architect in his own right, and he also worked extensively on Hollyhock House. Lloyd was his father’s right hand man during the early stages of construction when Wright was in Japan and Rudolf Schindler had yet to be brought on as project manager. In the 1940s, Lloyd spearheaded a restoration of the house while simultaneously taking some creative liberties and adding several new design elements such as cabinets. These cabinets remain today, even though the rest of Hollyhock House stays true to its original 1921 state. The house includes an underground plumbing system to allow water to flow from the central courtyard into an interior moat and then out again to the main pool outside. Due to its impracticality and wastefulness, Barnsdall discontinued the water flow to the fireplace moat shortly after its completion. Was Aline a water conservation pioneer? Hollyhock House offers exceptional views of many of the city’s landmarks, including the Hollywood sign and the Griffith Observatory. However, completion of Hollyhock House predated both famous sites—the sign went up in 1922 and the Observatory opened in 1935. Did Wright have a psychic intuition of what lay ahead? 10. Watch Out for the Piranhas! Being in Los Angeles, it was only a matter of time before Hollyhock House was repurposed as a movie set. In 1989, the building was used as the Piranha Temple in the cult classic Cannibal Women in the Avocado Jungle of Death. 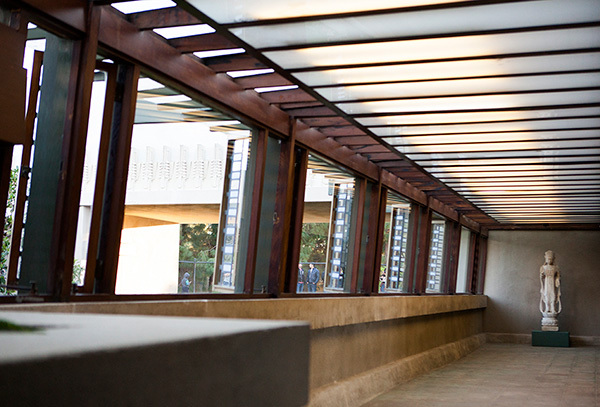 Many people often confuse Hollyhock House with a different Wright home, Ennis House, which is located two miles away. Ennis House has had more screen time, starring in Blade Runner, Buffy the Vampire Slayer, Twin Peaks, Rush Hour, and House on Haunted Hill. To be 100% true to the period, the Hollyhock House library contains historically appropriate books that have been donated by Angelenos. If you have any books in good condition from the 1920s and 1930s, you can donate them to the house. For more information, check out Barnsdall.org. 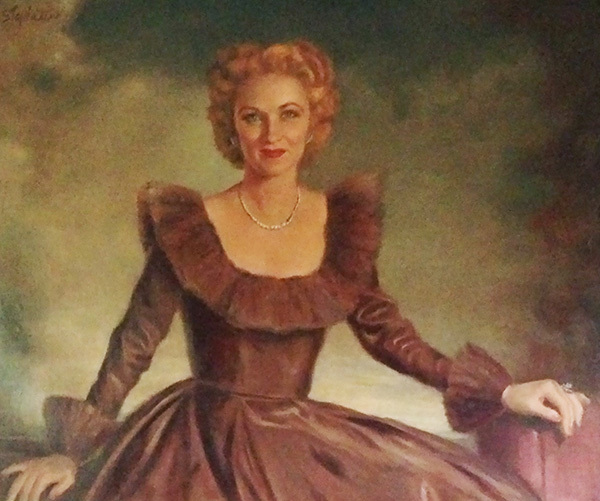 Barnsdall was infamously a single mother by choice, for she wanted a child but not a husband. In 1917 she gave birth to a daughter named Betty, also known as “Sugartop” because of her white blonde hair. 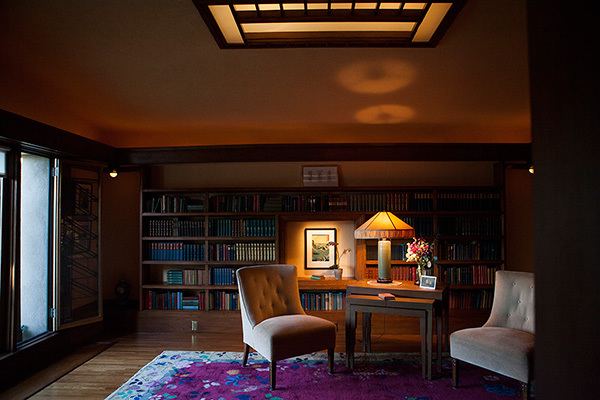 Photographs and paintings of Sugartop are displayed throughout Hollyhock House. Wright planned with Sugartop’s needs in mind, particularly in the designs for her bedroom and the outside areas of the home. Hollyhock House is located at 4800 Hollywood Blvd, Los Angeles, CA, 90027, and the house is open from Thursday to Sunday, 11am–3pm. Admission is $7 for adults and $3 for students and seniors with ID. Additional information can be found on Barnsdall’s website. Very good article! Happy to see this on the Getty site. Back in the 1990s I was a docent at Hollyhock House. To the best of my knowledge, tho, the statement in the introduction that “Wright was hired to design multiple buildings, but he only finished the plans for Hollyhock House before being fired” isn’t exactly true. Residence A, which is a fine example of Mr. Wright’s mid-western prairie style of the early 1900’s is still standing on the property and visitors to the Hollyhock House or the Art Museum see it just before reach the top of the hill on the northeast corner. Residence B, also a classic Wright prairie style house, which faced west, built into the hillside & was completed about 1919. Res B had to be torn down after Aline Barnsdall abandoned her Hollywood estate and donated all her structures & real estate to the City of L.A. due to deterioration after transients took up residence in it. Mr Wright also designed a completed outdoor theater structure on the southwest corner of the hillside which still stands today. Aline also planned a cinema building facing Hollywood Blvd and a nearby row of commercial shops (I think intended to face Vermont Ave) for which Wright produced renderings only.